Thank-You for your prompt service. The start up package was great! It really helped me out for my first wedding! 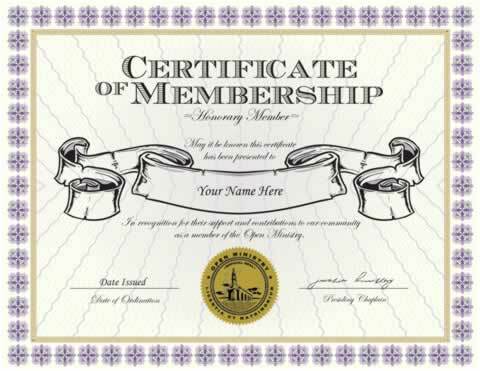 The Certificate of Membership is a decorative document in recognition of your support and membership with our ministry. 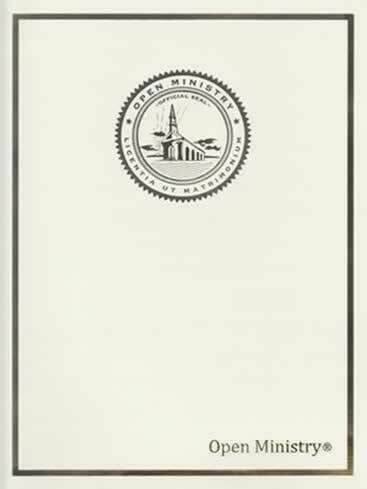 Printed with your name, date presented and signature of a church officer. Included is our gold embossed Ministry Seal. NOTE: You may be required to present an Ordination Credential and/or Letter of Good Standing in addition to register as a wedding Officiant. Certificates are printed on high quality traditional parchment enhanced with gold foil braided border, metallic ink flowering and starburst design in center. Suitable for framing and display. Membership Certificate is also included in some of our packages. I just want to say that I love all of you all product that I now Have in my own hands of proof to others after going to lots of religious schooling and was not ordained. I did not know that was the last step to finish after all certificate, diplomas was giving out after minister school know one told me that but through the holy spirit thru you all website. Addition to my previous review of the certificate of membership.I meant that the good works that you show,charities that you support all seem to be in the U.S.A. there is nothing wrong with this as we are all Gods children.My last statement wasn't quite clear enough.Rev,Philip Murray. I more than like this Certificate.I like its wording.This is why I like to give a small donation to the open-ministry. "Support and contributions to our community. "I know that the open ministry has charitable acts.It does not matter to me that you 'are across the pond'. We are all Gods children. Clean cut certificate, straight and to the point. Frames very well. when I get an office. Very Professional, Also Very Impressive. This Adds To The Professionalism Of This Ministry, As Well As Allowing Us To Know We Are Involved Also With This Ministry. I ordered the Certificate of Membership and am very pleased with it.